Burnley folk needed some good news after the council announced just a day before the replay that poll tax would be increased for 1992/93. It's a bit like season tickets now where the prices come out and you start having to find the money long before you've received what you paid for in the previous year. The 'basic' amount was set, residents were told, to increase by £39 to £231 but, and this was a massive warning, if the non-payers didn't do the right thing and pay up then the increase could be by a further £17 to £248. Meanwhile, the town's bionic man Steve Austin was out of jail. He wasn't really bionic, not as I'm aware and in truth was the owner of the Hen's Nest Mini-Market in Gannow Lane. He opted to serve 14 days on principle to support those who couldn't pay and his partner decided to do likewise. "Jail is nothing to fear," said the brave Mr Austin, who was reported to be having shoulder problems. Where was it he was held for the full 14 days? Was it Strangeways or even Walton or Wormwood Scrubs? None of those as it happened, he was detained in a cell at Great Harwood Police Station. Meanwhile the council desperately needed the money with news that urgent repairs had to be carried out on the Town Hall before it was closed down. It wasn't going to be cheap either with it being reported that it would be a multi-million pound scheme. "A lot of money needs to be spent on the Town Hall. If it isn't the Fire Brigade will be coming in to close it down," Councillor Mike Cooney, chairman of the Economic and Property Sub-Committee warned. "We are paying the price for putting these things off year after year and it must not be allowed to go on for a further year," he added. To me it looked as though the poll tax payers were the ones paying the price given that price rise. Maybe, just maybe, I paid for the cleaning of the Town Hall steps. I'm sure most people have heard of Kylie Minogue but maybe not so many have similar recollections in 1991 of SADMOSS. Kylie's new single - 'I Guess I Like It Like That' - was due for release and it had been mixed in Burnley by DJ Paul Taylor who was with Vision Masters at the Angels. Kylie - by then a massive name in the music world, a former star of Neighbours and yet she certainly had to play second fiddle in Burnley to SADMOSS. For those unfamiliar it was an organisation set up by a Mr John Miller in Burnley to help explore his musical tastes. To give it its full title it was The Society for the Appreciation of Depressing, Melancholy or Sad Songs. This bloke worked for Burnley Hospital Radio so God knows what he was doing to patients who might have been looking for a lift as they recovered from illness, although he was quick to point out that the radio station and SADMOSS were not connected. He did initially choose SADSONGS for this society (Appreciation of Depressing, Sad Or Nauseating Gloomy Songs). I suppose he might have been on to something - Sad Songs say so much. Ahead of the cup tie came news that two regular Burnley supporters would be missing the game. Shirley Wrigley and Deric Roberts had met watching the Clarets from their seats in the cricket field stand where love blossomed. Well, maybe the blossoming wasn't in the cricket field stand. They'd tied the knot and yet, despite being such big fans, were now set to miss four games whilst they enjoyed a honeymoon in Tenerife. There's a sad note to this story though. Deric unfortunately passed away in April 2008 in his early 60s after a fight against cancer. Whilst away they missed Burnley winning through in the FA Cup at the second time of asking. The draw at Turf Moor in the first game was the only game under Jimmy Mullen's management that hadn't been won but that was most certainly put right at Belle Vue where the Clarets won for the second time in three months. The 3-1 win came with an outstanding second half performance which was described by Edward Lee in the Burnley Express as every bit as good as anything produced in our recent run. He said that whilst the first half was solid, the second half was outstanding and would have been good enough to account for any side involved in the first round of the competition. The win was based on a superb defensive performance which wasn't even affected by the loss of captain John Pender just a few minutes into the second half, and with the firepower up front we were always too good for Doncaster Rovers. Mullen made just the one forced change to the side that had won on the previous Saturday at Maidstone with Chris Pearce coming in for Andy Marriott in goal. Marriott would however be available again for one more game at Northampton on the following Saturday. In that solid first half performance it took us until seven minutes before the break before we took the lead. John Francis got down the left wing and played the ball across for Steve Harper who carried the ball into the box. HIs first shot was blocked by goalkeeper Mark Samways but HARPER was on hand to collect the rebound, take it past the goalkeeper and slot it into the empty net. It was our first real chance and the lead lasted until just before half time. Mark Rankine got in a cross from the right wing which was headed by Shane Reddish for Billy WHITEHURST who made no mistake from close range. Level again at the interval but that's as good as it got for Doncaster even though Burnley were forced into that early second half change with Pender's injury. Mark Yates came into the midfield with the versatile Andy Farrell slotting in to partner Steve Davis in the centre of defence. Within no time Burnley were back in front with a similar goal to the first. Again Francis played the ball but this time the winger HARPER flung himself at it and looped it over Samways. Burnley just dominated with Yates, the substitute, in inspirational form on the ground where he'd made his Burnley debut in August. He was involved in everything and when we wrapped it up with a third close to the end it was fitting that he played his part. Yates it was who played a brilliant through ball from his own half to release Roger ELI who shrugged off three defenders before calmly slotting the ball under Samways from the edge of the box. It was a clinical finish from the Burnley striker and it made the game safe. 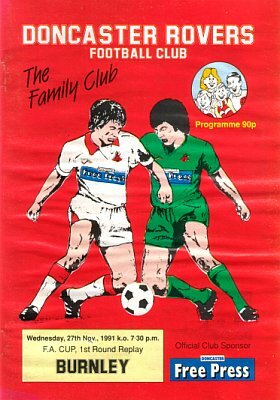 Doncaster Rovers: Mark Samways, Shane Reddish (John Cullen 77), Brian Rowe, Andy Crosby, Brendan Ormsby, Colin Douglas, David Harle, Eddie Gormley (Max Nicholson 82), Mark Rankine, Billy Whitehurst, Kevin Noteman. Burnley: Chris Pearce, Ian Measham, Joe Jakub, Steve Davis, John Pender (Mark Yates 52), Andy Farrell, Steve Harper, John Deary, John Francis, Mike Conroy, Roger Eli. Sub not used: Graham Lancashire. Our opponents in the next round, Rotherham United, also won through on the night before but not quite so convincingly against Scunthorpe United. They won 7-6 on penalties after the replay had ended 3-3. 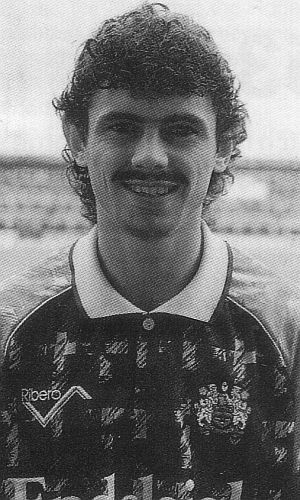 Interestingly the Rotherham side included both Billy Mercer, Burnley's goalkeeping coach, and Ally Pickering whilst Scunthorpe's team featured Graham Alexander and Ian Helliwell who scored the first Scunthorpe goal.